A beautiful addition to our fine line of fabrics, Wee Play by Kathy Brown. A fun children's cotton fabric sure to add some sparkle to any quilt. 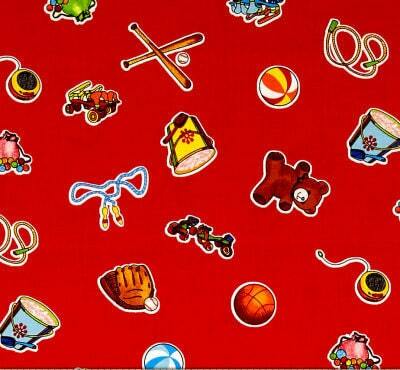 A bright red background with fun toys that wee ones play with. A smiling bear, buckets, jump ropes, baseball mits, balls, yoyos, bats and so much more in wonderful shades of yellow, blue, green orange, blue and brown. This great fabric measures 44 inches wide and objects measure approximately 1 1/4 inches in height. You can not go wrong adding this great fabric to your stash. Who wouldn't want this to show off! All fabric from The Quilted Nursery Children's Fabric Store is cut directly from the bolt in continuous yardage. We now offer fractional yardage cuts for your shopping convenience. All shipping refunds are sent on shipment of fabric. Same day shipping except for Sunday and holidays.